Beit Halochem Centers in Israel are a home away from home where disabled veterans come to regain their physical abilities and learn new skills on the long road to regaining their quality of life and independence. These courageous men and women have personally sacrificed so much for the State of Israel. 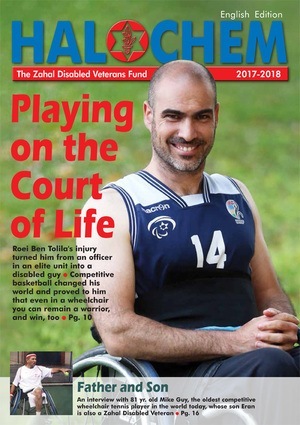 They deserve the best after they leave the hospital, and Friends of Israel Disabled Veterans-Beit Halochem is there to help them rebuild their lives. Members are encouraged to participate in sports and related activities suited to their individual disabilities. There are also many social, language study and arts based programs offered at the Centers. Treatment in the physical therapy institute complements other measures in the overall rehabilitation process. Treatment is also available, if necessary, for members whose health has deteriorated over the years. A team of skilled physical therapists treats those referred by rehabilitation specialists in hospitals, or by clinics of the Israel Defense Ministry Rehabilitation Division. Beit Halochem centers range in size from 5,500 square meters to 10,000 square meters. Standard design and equipment includes an auditorium, multipurpose gymnasium, classrooms, fitness rooms, swimming pool, occupational therapy unit, physical therapy unit, cafeteria, offices and a social wing. A great deal of thought and effort went into design and construction at each Beit Halochem center. All facilities are specially adapted to accommodate various disabilities. Particular attention was paid to the needs of the blind and those who need to use wheelchairs. The sports, classes, and social events held on the premises have been adapted to make it possible for all veterans to participate.